"I am the eternal optimist. No matter how rough it gets, there's always light somewhere. The rest of the sky may be cloudy, but that little bit of blue draws me on." 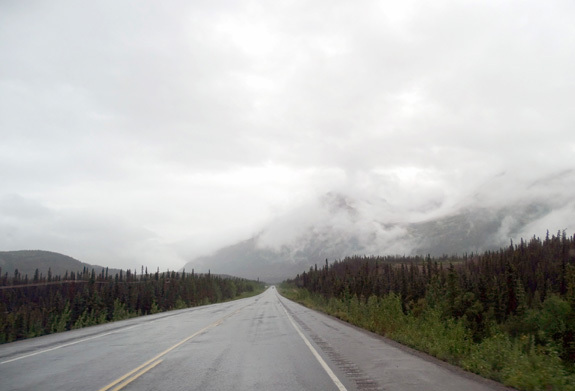 Jim and I were so desperate for some blue sky and dry air that we left our beloved Denali National Park a day early. When we woke up to more rain on Monday morning and realized it would be raining for the next week in the park we decided to head for Anchorage, where we found more sun. 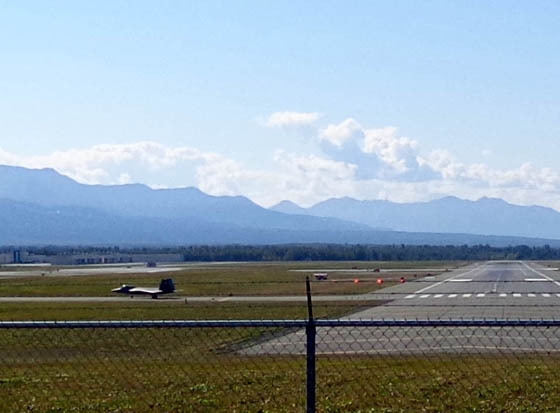 Our odds of drier weather this week were considerably better in Anchorage than Denali. The temps have been 5-10 degrees warmer in Anchorage, too. We awoke to upper 40s F. at Riley Creek that morning and enjoyed upper 60s, moderate humidity, and partly sunny skies a few hours later at Joint Base Elmendorf-Richardson (JBER). 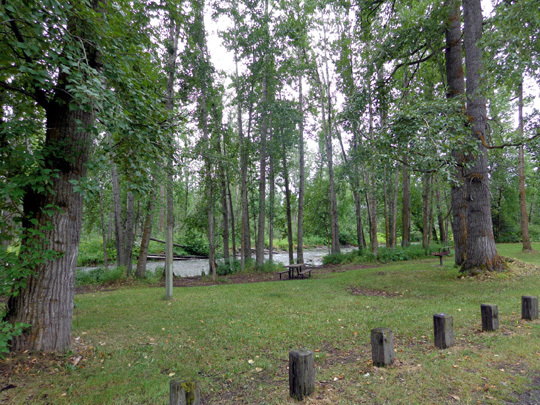 In this entry I'll show some scenes from our five-hour drive along the Parks and Glenn Highways, our new campsite, and some activities on base. 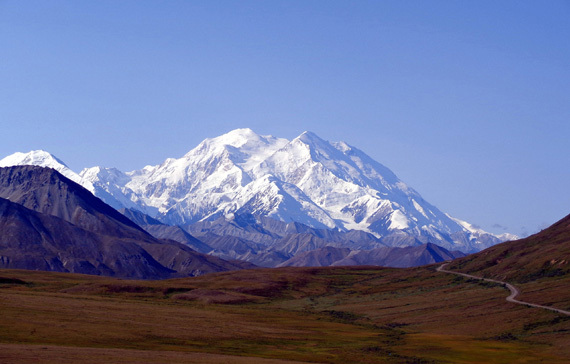 On a clear day, this is a memorable drive with stunning views of Denali and other mountains in the Alaska and Chugach Ranges. On Monday, unfortunately, it was mostly a wet and/or overcast mess with limited views until we got near metro Anchorage. 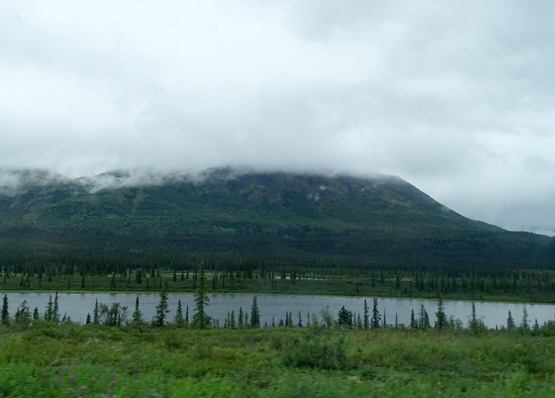 We didn't even decide to leave Denali NP until shortly after we got up that morning. In just an hour we ate breakfast, made our decision (it was an easy one -- no refund, but no regrets), got the Cameo ready for travel, vacated our campsite, and went to the nearby dump station to get rid of most of our clean, gray, and black water weight. We drove south from the park entrance on the Parks Hwy. 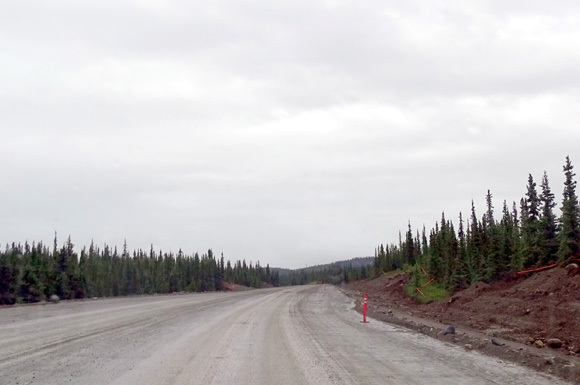 and Glenn Hwy. 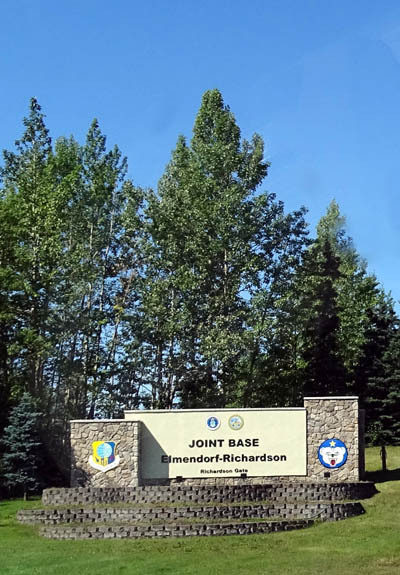 to exit 8, the most northerly gate we can use at JBER. Traffic was moderate the whole way. There were several areas of active road work where traffic got slowed down or stopped, so lots of vehicles ended up behind us and other RVs heading south and had to pass us when they could. I'm surprised so much road work is done on rainy days. Good thing, or they'd never get it done during Alaska's very abbreviated spring-summer-fall season. In addition to one traffic stop of five minutes we took a break at the Denali South Viewpoint to eat lunch. There were no views with low clouds and rain, so no use taking pictures in that location. We also got diesel fuel at the Tesoro near the Talkeetna intersection, about MP 100 on the Parks Hwy. The cost was $3.31/gallon, much better than in Healy or Cantwell but more expensive than Anchorage. 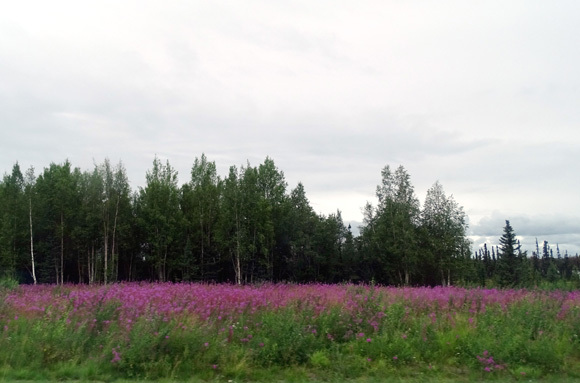 I didn't know if they'd still be blooming near Anchorage since they were at their peak farther north in Denali NP. Coming into the base felt like coming home! This is our fifth stay here (second time this summer + three times in 2012). 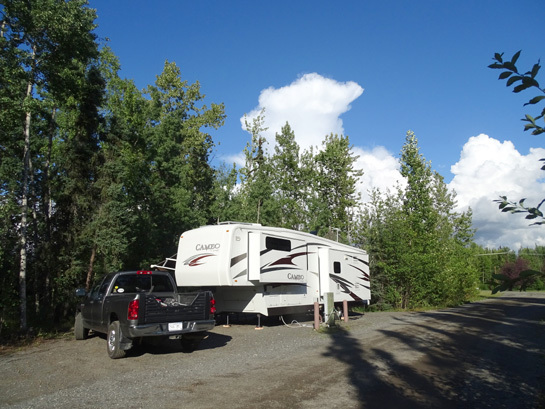 When we pulled up to the campground host's cabin near the entrance we could see at least two empty spots at the beginning of the first loop. Dan greeted us and said to pick any spot we wanted -- all the sites now have full electric power! Only half the sites had electricity when we were here several weeks ago. Good thing they got the system fixed because the campground has been mostly full this week. The electricity, water, and sewer work just fine in this site. It took a couple days to get the camper dried out inside because of all the moisture from rain and propane heat at Denali. With electricity we can run the dehumidifier and electric space heaters, which don't put out any moisture. We're happy to have full hookups, "free" WiFi, and a TV signal again. After we got settled in Jim went to the MWR office to pay for our site for the next six days. 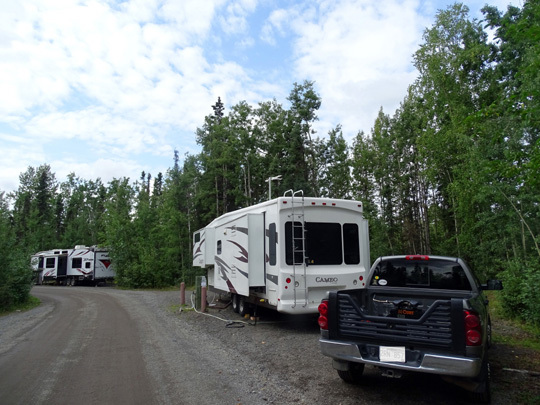 At $33/day it's not exactly cheap but it's less expensive than any private campground in this area and Black Spruce is far nicer. When I was walking Casey around the campground the first day I saw a familiar face -- Ron, a full-time RVer who used to live in Virginia. Ron's understandably very upset about losing Aspen. We'd be very upset if we had to put one of our dogs to sleep, too. I'm glad we were able to spend time with Ron this week so he could talk to other dog lovers about his loss and he could get some puppy love from Casey and Cody. He decided to move his 5th-wheel to the site across from us so he'd have a better internet signal and we could all spend more time together. I miss Denali National Park but with all the rain predicted there in the next week or two, I'm glad to be back in Anchorage where we at least have electricity to stay warm and dry for the next six days. Jim's happier when we have TV, too. It also gives us more time to attend to some basics before we head to the Kenai Peninsula -- stocking up on groceries and supplies again at WalMart, Sam's Club, PetsMart, and other big box stores, changing the oil in the truck at the auto hobby shop on base, shampooing the carpet, etc. 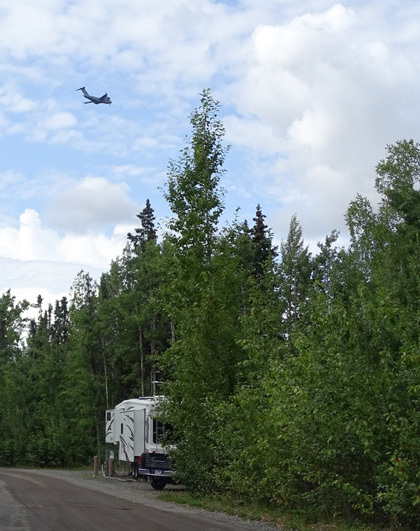 A C-17 cargo plane flies over our campground. Air Force bases are noisy, but it's fun to watch the aircraft. I've been walking the dogs in the campground and other areas on base this week, as well as off-base. I'll have separate entries about several hikes in the Chugach Mountains and at Eagle River. a couple miles from our campground. 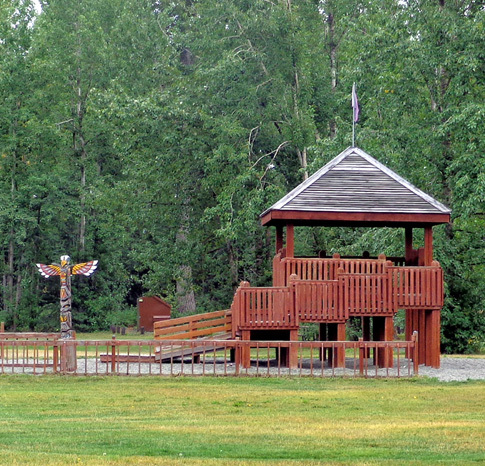 Jim and I both enjoy riding on this large base and the extensive network of bike paths in the metro Anchorage area. I'll have a separate entry with photos from the Campbell Creek ride we did this week. Since Jim doesn't have any more bike races scheduled he isn't as focused on long rides now. He was disappointed in the road at Denali NP; he remembers having a lot more fun riding there three years ago than he did this time. A big reason is that neither of us saw nearly as many bears, moose, caribou, wolves, Dall sheep, or other critters at Denali this summer when we were cycling and hiking. On Tuesday we got shaken by another earthquake after supper. 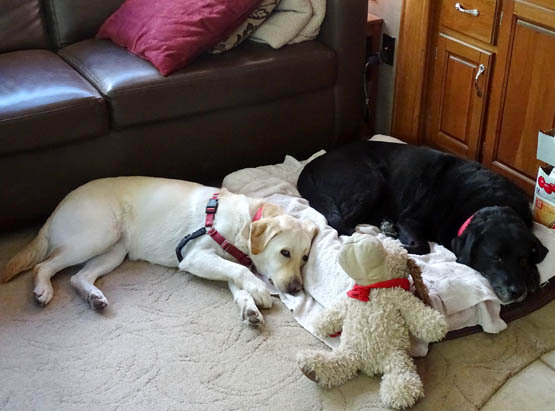 Jim was out in the truck and I was in the camper with the dogs. He thought I was jumping up and down on the bumper of the truck and I thought he was up on the roof or rocking the camper somehow! He realized before I did that it was an earthquake. We aren't used to these things. The magnitude-6.3 earthquake felt across Southcentral Alaska and as far north as Fairbanks late Tuesday was unlike any to hit the Cook Inlet region in decades, the Alaska Earthquake Center said Wednesday. As of Wednesday morning, about a dozen aftershocks had been recorded from the earthquake, which originated at a depth of 73 miles, said seismologist Natalia Ruppert. That's a normal number for a "deeper event," Ruppert said, as compared to the magnitude-6.9 earthquake in the Fox Islands on Sunday, which originated at a depth of 38 miles and generated "hundreds of aftershocks." The aftershocks from Cook Inlet's Tuesday quake have been relatively small -- the largest was magnitude 3, Ruppert said. But the quake was unusual given its magnitude and depth, she said. 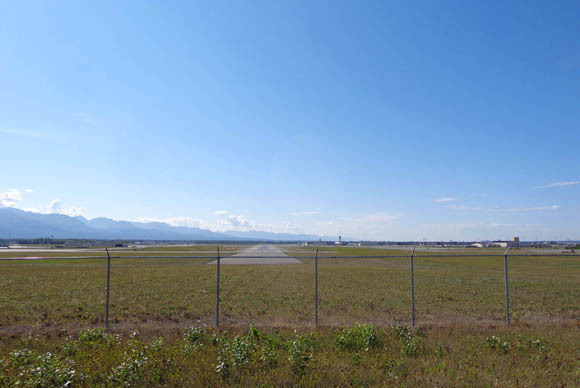 "We looked up some of the history in this region, and the last time we had a similar earthquake in Cook Inlet, it was � in 1988," Ruppert said. Tuesday's quake was "the largest since that 1988 (quake) in the deeper portion of the seismic region," Ruppert said. While the earthquake originated roughly 9 miles southwest of the Mount Iliamna volcano and 43 miles southwest of Mount Redoubt, the tremor was not related to volcanic activity, according to the Alaska Volcano Observatory. "It's pretty clear that this was a tectonic earthquake not related to the volcanoes," said David Fee, acting coordinating scientist with the agency. Among distinguishing factors, the depth of the earthquake and relatively large magnitude helped determine that it was tectonic. Most volcanic earthquakes in Alaska register at magnitude 1 or 2, Fee said. "Volcanically, this is below us," Fee said, so the agency wasn't too involved in monitoring the seismic event. AND MORE RAIN . . .
We weren't able to completely avoid rain by moving a day early to Anchorage but it was still a good decision. 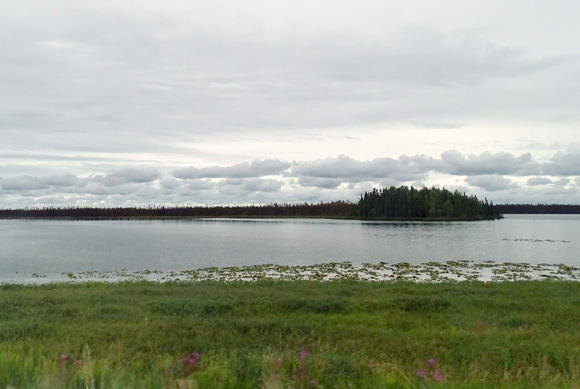 We've had intermittent rain and sun since our arrival in Anchorage -- not as much sun as we'd hoped, but not so bad since we have electricity, TV, and more things to do indoors in Anchorage than at Denali. Neither of us is motivated to get out and do much when it's rainy/misty. Three years ago everything here was new to us and we didn't know if we'd ever be back. We just got out and did things more then, even in the rain. 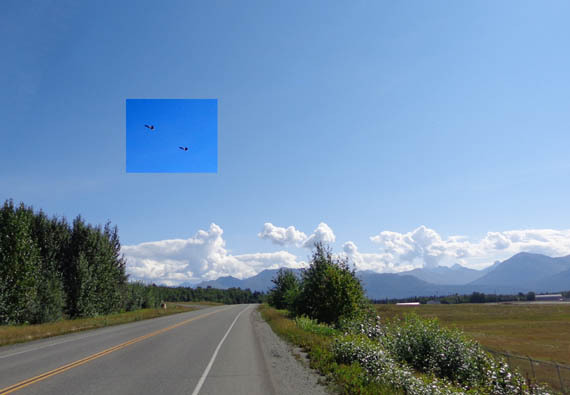 Two fighter jets come in for a landing at JBER. The runways are a couple miles from the campground. Our lifestyle and attitudes have morphed since we became full-timers -- we are more relaxed and less frenetic now. If we miss a thing or two, oh well. In addition, this is our second time to spend all summer in Alaska. Some of the things we did as first-time visitors we aren't compelled to do again. We're adding some new venues and activities this time but this whole trip is more relaxed since it's the second time around. Once again, we don't know if we'll ever be back up here again. I made a list today of things to do even in the rain, just in case this IS the last time I'm ever in Alaska.